“Whoa, look at that stone!” my friend Sheila exclaimed as we rounded a bend on one of the many twisting back roads of West Cork. And her exclamation was on point! There, sitting on a hill, stood both a tall and very wide standing stone, illuminated by the setting sun. As our car crept along like a stalker I couldn’t help but wonder, how did that stone come to be in that field out in the middle of nowhere? After a friendly, but somewhat suspicious greeting from the farmer upon our unexpected arrival, he asked us to wait while he finished up with the cows. Our tennis shoes wandered around the mucky dirt as we waited. I spotted a few horseshoes up on the wall of his barn. It’s a tradition here in Ireland to place horseshoes with the opening facing up, like a U, to catch good luck and abundance, both on homes and barns. And this farmer had a few. When the last cow was secured, just as promised, out came our mysterious farmer and we began a conversation that blew (and still does blow my mind). 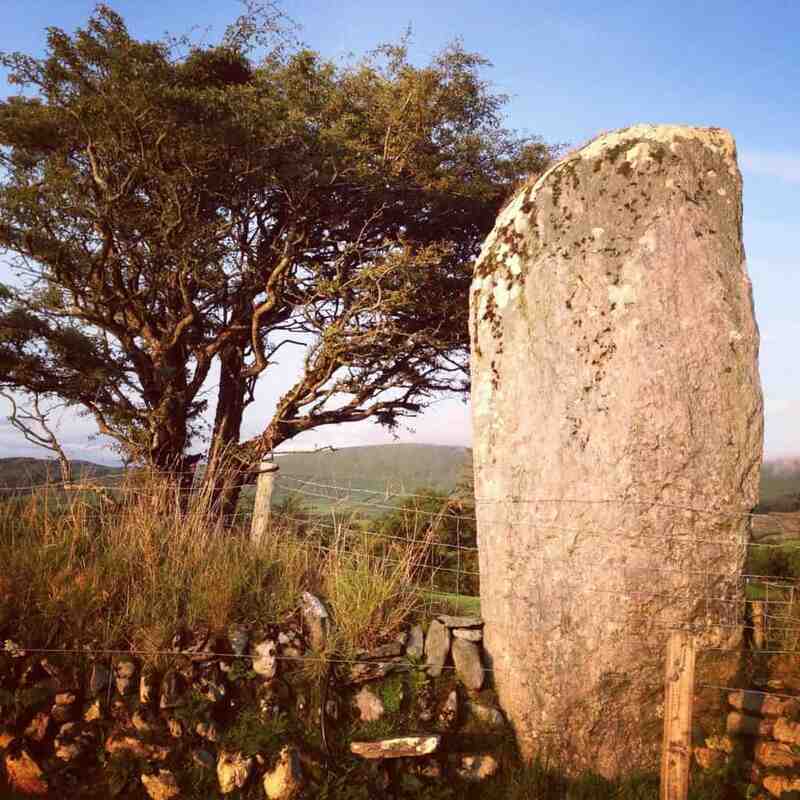 First, the standing stone was a mystery, even to experts. The University of Cork had been out to investigate it; they measured its dimensions, mapped its location, and added it to their data of the many neolithic monuments of the area. But no conclusion as to what it was used for or who brought it there had been made. As our conversation wound through many topics, including this beautiful mystery of a stone, it was discovered that this man, Martin, grew up in Ahakista. That’s where Sheila grew up too! Turns out she was good friends with one of his sisters called Caroline. It’s always a lovely (and relieving moment for many Irish people) when you can place your connections to one another. This whole experience was just so magical for me that, in the privacy of my own mind I thought … wouldn’t it be amazing if I was somehow connected to this man? The likelihood seemed slim, the conversation continued, and the sun slowly began to make its way down towards the horizon. Martin spoke more about the stone, about his farm, and then about his other siblings. When he mentioned a sister that lived in the US and ran retreats on the Sheep’s Head, my ears perked up. To this day, I remember the sensation of that moment. It was as if a rusty cog in my brain slowly, painfully, began to turn, trying to dig up a memory, or something, related to what Martin was saying. Luckily this cog continued its circular movement and I had the clarity to pull out my phone. The battery was on no more than 2% at that stage of the day. I struggled to open Facebook, pulling from the 1 bar of reception I was getting, but finally managed to find what I was looking for. A Facebook profile of one of my friends. “Why, yes, it is!” Martin said. My phone died and Sheila and I both screamed with excitement. It turns out that this woman, Marion, and Martin’s sister, had contacted me ages ago. She somehow found my Retreat to Ireland website and got in touch saying she was doing similar (yet different) retreats on the Sheep’s Head and that we should connect. And so we became Facebook friends, but never met in person. Yet here I was, speaking with her brother, the guardian of the standing stone! Sheila and I were buzzing. We headed back to the farmyard and in my excitement, I asked Martin if, by any chance, I could have one of his horseshoes? It felt like such a beautiful and lucky experience that I wanted something to remember it by. And I’d been looking for a horseshoe to add to my house back in the States for a couple of weeks, waiting for the right one. And bless that man, he gave me one. I have it to this day and brought it with me when I moved to Ireland. We headed into Bantry town to get a bite to eat. The sun had set almost completely by now and we were ravenous. We stepped into a brightly lit fish & chips shop and hungrily ate our cod and chips and mushy peas, musing over our adventure. What a day! The next day, Sheila got a text from Caroline. Remember? The sister Sheila knew through Martin? Caroline messaged knowing nothing of what had happened the day before. She said that she was in a taxi at the Dublin airport and got chatting with the cabby. He asked her where was from and when she said Ahakista on the Sheep’s Head, he paused. Sheila and I screamed for the 2nd time in the last 24 hours. Retreat to Ireland 2014 had just ended and we knew it was one of our participants! I don’t know what these kinds of encounters mean. People all over the world have many different names or meanings for these kinds of experiences. But I do know that that standing stone started a whole lotta beautiful connection in my life, and for that, I am grateful.